Products to suit every trader type's needs - all offering real-time alerts and analysis, helping you maximize your trading profits! We offer a variety of investing resources, including our popular Morning Call report, to help you stay on top of the market. Be the first to get actionable market insights, discover profitable trading ideas and manage your personalized watchlist directly from your phone. 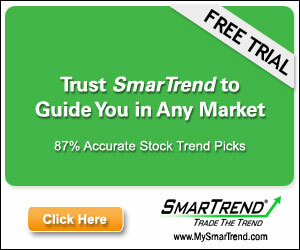 "My first week I made two trades based on the SmarTrend indicators...That almost pays for a one-year subscription!!!" "I have only been recieving the SmarTrend newsletter for a few weeks and it has been magic! I made a 47% ROI within 2 weeks based on information I recieved through SmarTrend. " "I bought ISLN on SmarTrend’s recommendation, and more than doubled my money, making close to $45,000 dollars."